Pliteq is a designer and manufacturer of recycled rubber. The 70 members at the plant make products for residential and commercial sound and vibration control. They also manufacture rubber flooring underlay. “Achieving fairness, respect, and dignity in the workplace begins with union representation,” says Wayne Hanley, President of UFCW Local 1006A. “This victory is a testament to the workers at Pliteq, who actively sought out union representation to improve their working conditions and livelihoods,” he adds. Job security, vacations, improved benefits, and protection against discrimination and harassment were key issues during the unionization drive. 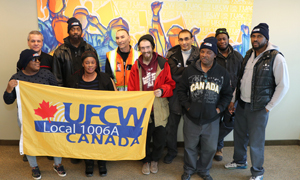 “Reaching out to an organizer is easy and might be the key to changing your life at work,” says Lesley Prince, Coordinator of Organizing for UFCW 1006A.